The latest advancement in treatment for Vertigo is Upper Cervical Chiropractic Care that is now producing fruitful results. What are the most common types of injuries that leads to Vertigo symptoms? All these cases above can result in the misalignment of one of the first two cervical vertebrae namely the atlas and axis. Many people do not realize that your position sense is controlled out of the lower brainstem which is in the upper neck. Upper Cervical Chiropractic Care has been a solution for those that suffer the symptoms of Vertigo as a best kept secret. 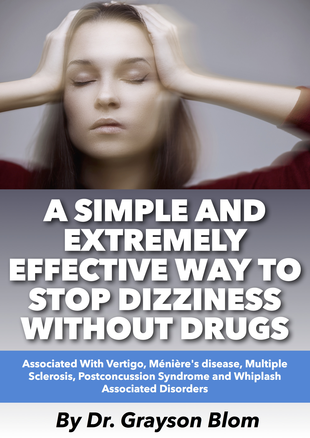 To learn more about the connection between head and neck injuries and vertigo download our complimentary e-book A Simple and Extremely Effective Way to Stop Dizziness without Drugs by clicking the image below. Vertigo is a real problem with the dizziness. loss of balance, nausea, etc. all of these symptoms result in poor quality of life. If Vertigo has become your biggest enemy, we have good news for you! While many practitioners look to only cover up the symptoms of vertigo, Upper Cervical Chiropractic Care is a new found hope targeting the most common source of the condition directly. Ever Hear of Upper Cervical Chiropractic Care? Upper Cervical Chiropractic care has a proven track record of getting very difficult cases well when all others have failed. Do not wait for your symptoms to get worse making your life a misery. Dr. Grayson Blom works with a nationwide group of Doctors expertly trained and specializing in the Upper Cervical procedure. He is one of the few Doctors trained and certified in the Upper Cervical procedure in the state of Idaho. If you are interested in getting help please feel free to give us a call at (208) 559-0541 or click the button below to request a consultation.